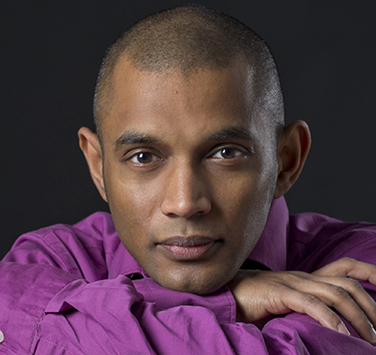 Sri Lankan-born Dinuk Wijeratne is a JUNO, SOCAN, ECMA, and Masterworks-winning composer, conductor and pianist who has been described by the New York Times as “exuberantly creative” and by the Toronto Star as “an artist who reflects a positive vision of our cultural future”. His boundary-crossing work sees him equally at home in collaborations with symphony orchestras and string quartets, Tabla players and DJs, and takes him to international venues as poles apart as the Berlin Philharmonie and the North Sea Jazz Festival. Dinuk made his Carnegie Hall debut in 2004 as a composer, conductor, and pianist, performing with Yo Yo Ma and the Silk Road Ensemble. A second Carnegie appearance followed in 2009, alongside tabla legend Zakir Hussain. Dinuk has also appeared at the Kennedy Center (Washington DC), Opera Bastille (Paris), Lincoln Center (New York), Teatro Colón (Buenos Aires), Sri Lanka, Japan, and across the Middle East. He was featured as a main character in What Would Beethoven Do? – the documentary about innovation in classical music featuring Eric Whitacre, Bobby McFerrin, and Ben Zander. Dinuk has composed specially for almost all of the artists and ensembles with whom he has performed, to name a few: Suzie LeBlanc, Kinan Azmeh, Joseph Petric, David Jalbert, Bev Johnston, Zakir Hussain, Sandeep Das, Nick Halley, Tim Garland, Ed Thigpen, Ramesh Misra, Ed Hanley, Eric Vloeimans, Buck 65, the Gryphon Trio, the Apollo Saxophone Quartet, TorQ Percussion, the New Juilliard Ensemble, the Afiara and Cecilia String Quartets, and the symphony orchestras of Toronto, Vancouver, Calgary, Winnipeg, Nova Scotia, Fresno, Buffalo, Illinois, Windsor, Victoria, Asheville, Thunder Bay, and KwaZulu Natal (South Africa). Having grown up in Dubai, Dinuk studied composition at the Royal Northern College of Music (UK), and was subsequently invited to join the Juilliard studio of Oscar-winner John Corigliano. Conducting studies followed at Mannes College under David Hayes, and doctoral studies with Christos Hatzis at the University of Toronto. Dinuk has conducted the orchestras of the National Arts Centre, Winnipeg, Thunder Bay, PEI, Scotia Festival, and appeared numerous times with Symphony Nova Scotia during his three-year appointment as Conductor-in-Residence. He is the recipient of the Canada Council Jean-Marie Beaudet award for orchestral conducting; the NS Established Artist Award; NS Masterworks nominations for his Tabla Concerto and piano trio Love Triangle; double Merritt Award nominations; Juilliard, Mannes & Countess of Munster scholarships; the Sema Jazz Improvisation Prize; the Soroptimist International Award for Composer-Conductors; and the Sir John Manduell Prize – the RNCM’s highest student honor. His music and collaborative work embrace the great diversity of his international background and influences.